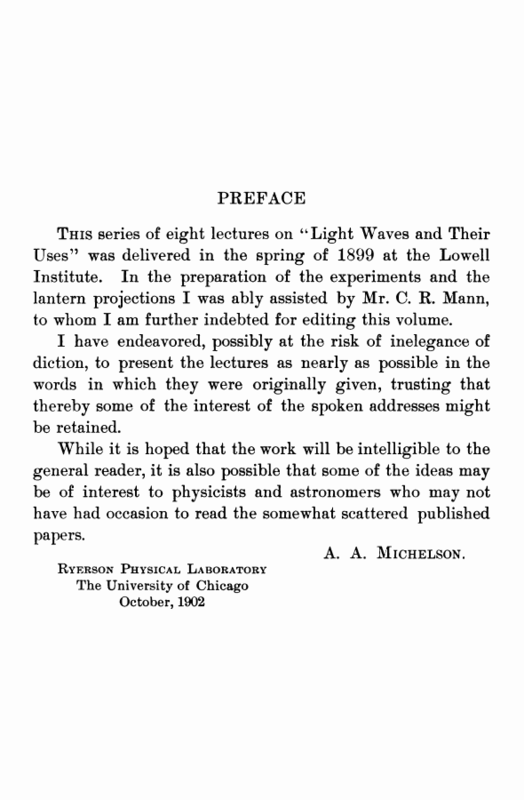 This series of eight lectures on “ Light Waves and Their Uses” was delivered in the spring of 1899 at the Lowell Institute. In the preparation of the experiments and the lantern projections I was ably assisted by Mr. C. E. Mann, to whom I am further indebted for editing this volume. I have endeavored, possibly at the risk of inelegance of diction, to present the lectures as nearly as possible in the words in which they were originally given, trusting that thereby some of the interest of the spoken addresses might be retained. While it is hoped that the work will be intelligible to the general reader, it is also possible that some of the ideas may be of interest to physicists and astronomers who may not have had occasion to read the somewhat scattered published papers.